Since its inception way back in 1935, the Chevrolet Suburban has gone through a stunning transformation – from the tough, no nonsense carrier constructed with wood body panels, built specifically for National Guard and Civilian Conservation Corps units in the US – to the formidable modern family hauler it is today. In this post, we’re profiling the new 2018 Chevrolet Suburban and all its people-carrying glory. The 2018 Suburbans’ primary focus was to combine the utility of a truck with the versatility you’d usually find in a family SUV, all wrapped up with the luxurious and innovative features you’d find in a premium sedan. Styling is angular and bold with flared arches and muscular body panelling, the Suburban is polished off with available options like 20 inch chrome wheels, chrome side steps, bright body mouldings, polished exhaust tips, chrome grille inserts and recovery hooks. Aside from its visual appeal, the Suburban was designed to be as functional and practical as humanly possible, with 29.3 cu.ft of cargo space behind the third row of seating, and total available cargo room of 121.7 cubic feet. Further, the front console in big enough to host a full size laptop and the innovative door storage containers have the capacity to store umbrellas, water bottles and other crucial items. The 2018 Suburban is powered by a technologically advanced 5.3L EcoTec3 V8 power-plant cranking out 355 horsepower and 383 lb/ft of torque – equating to a maximum towing capacity of 8,300 pounds; enough to haul and transport just about anything from trailers and fifth wheels, to boats and utility trailers. Efficiency is also a focal point of the big Chevy’s powertrain. The muscular V8 is also capable of achieving a best-in-class highway fuel consumption rating of 10.4 L/100 km. The combination of power and efficiency is thanks in part to innovative lightweight suspension that helps optimize fuel economy while still maintaining the stiff and solid ride that the Suburban is prized for. No modern SUV is complete without a vast array of innovative and convenient tech. The 2018 Suburban includes an available 8-inch touchscreen with reconfigurable cluster and driver info centre, and a head up display that provides easy access to important vehicle diagnostics and updates. Multimedia support for both Apple and Android platforms is also included, compatible with either Apple CarPlay and Android Auto. These tools allow drivers to safely interact with calls, messages, music, select apps, calendars, and navigation functions. The world wide web is along for the ride as well, with Chevrolet’s 4G LTE connectivity capability, with available built-in Wi-Fi hot spot. The Impala can connect up to 7 mobile devices seamlessly to cater to work schedules or surfing for the newest tunes. Always the family-pleaser, the Suburban also comes with an available rear-seat ceiling mounted Blu-Ray entertainment system in both the second and third rows to keep your backseat passengers entertained and happy for hours. The system comes complete with HDMI and USB connectivity and digital headphones. The MyChevrolet app is the all-encompassing command centre for your new Impala, able to lock/unlock doors, send destinations to your nav system, view engine and mechanical diagnostic information, and set parking reminders from anywhere. 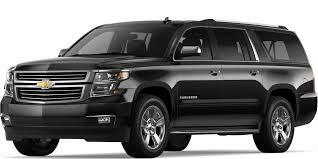 The 2018 Chevrolet Suburban offers advanced safety features to help prevent potential collisions, and modern tech that intervenes and calls for help if one should happen. The Suburban comes with a slew of standard and available safety features like low speed forward automatic braking for when the vehicle is travelling below 80 km/h (50 mph) and the system senses that a front-end collision with a detected vehicle is imminent. Forward collision alert which uses HD camera technology, helping to alert drivers of slowing in your path. There’s also a safety alert seat that gives you the option of seat-bottom vibrations instead of audible safety alerts. In the back end, drivers have access to an available rear cross traffic alert, rear park assist, and side blind zone alerts. The longest running nameplate in automotive history, this daily errand runner and toy-hauler may have intimidating roots as a military transport vehicle, but these days it’s primarily suited to urban jaunts and trips to the cottage – but make no mistake, under the sleek and sophisticated new exterior lies the history of a legendary, capable brute.